The Natty Professor: A Master Class on Mentoring, Motivating, and Making It Work! A timeless book of lessons on mentorship, teaching, and learning from New York Times bestselling author Tim Gunn, host of the Emmy Award–nominated Project Runway and the reality show Under the Gunn. 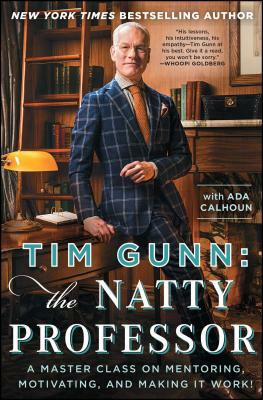 While Gunn’s Golden Rules showcased Tim “as life coach,” imparting lessons based on his personal experiences, Tim Gunn: The Natty Professor will focus on Tim “as teacher.” Divided into sections on common themes—truth-telling, empathy, asking, cheerleading, and hoping for the best—this practical, timely book takes us on a journey through life lessons and uses Tim’s own personal experiences, from the classroom to the therapist’s office, to illustrate larger concepts. So grab a pencil and start taking notes: class is officially in session! "Tim Gunn's done it again but this time he's going to surprise you because he goes places you didn't realize he's been. His lessons, his intuitiveness, his empathy—Tim Gunn at his best. Give it a read, you won't be sorry. Lessons for all!" "Tim Gunn is fun and chatty, but most of all he is incredibly knowledgable and informed!"